Oxford Properties Group has injected more than $110 million into its Les Promenades Gatineau shopping centre since purchasing the mall in 2012, and the investment is starting to pay dividends. With the recent opening of its HomeSense and Marshalls stores, Les Promenades has added two more major assets. The 36,000-square-foot additions are just the latest in a series of changes and improvements to the mall by Oxford. Since Oxford purchased Les Promenades, 48 new stores have been added and nearly 40 other stores have either been relocated or renovated. While tenant turnover in a shopping mall is nothing new, the sheer volume of change within Les Promenades is significant. In all, the mall contains 155 retailers and services. The new stores, redevelopment of existing retail space and extensive renovations to common areas are all part of Oxford’s attempts to revitalize the property. 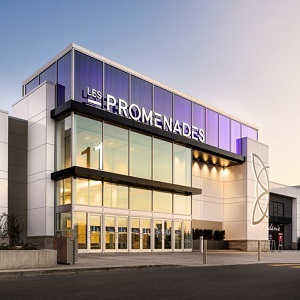 “We started construction around January of 2014, did the grand reopening in 2015 and since then we never stopped bringing in new key retailers,” said Francis Vermette, the general manager of Les Promenades. Oxford will be celebrating the property’s 40th anniversary this year — Les Promenades originally opened in 1978 — a little extra incentive to add some lustre to the mall. Approximately 120,000 square feet of common area has been renovated with new floors, the addition of skylights and a redesign of the food court, which now seats more than 750. The mall was expanded by 25,000 square feet to re-align the front of the shopping centre, while the landscaping overhauled and the parking lot repaved. “The property really needed some love before Oxford bought it. The ceilings were low, there was no light, and it was kind of cheesy. The decor hadn’t been updated,” said Kathleen Michaud, marketing director at Les Promenades. Oxford didn’t stop with those initial renovations, and has continued to expand and renovate stores. An 80,000-square-foot Simons store was introduced in 2015, and its Hudson’s Bay (HBC-T) location underwent a $15-million renovation which was completed in October 2017. With plans to add up-market, trendy tenants Pandora and MAC Cosmetics to the roster this year, Oxford is committed to attracting retailers Gatineau-area residents previously needed to travel to access. The benefits of the continuous renovations and expansions have started to flow, and also expanded the mall’s reach into neighbouring Ottawa (Gatineau and Ottawa straddle the Ottawa River, which also serves as the Ontario-Quebec border). Gatineau’s population is about 276,000, while Ottawa’s is more than 934,000. In 2015, just 15 per cent of the mall’s traffic originated from Ottawa, but so far in 2018 Oxford says that figure has risen to 30 per cent. Hence the additions of Homesense, Marshalls, Pandora et al. As for the future, Les Promenades is experiencing foot traffic increases of 10-12 per cent annually, and Oxford’s top priority is to continue expanding offerings. Management is attempting to source one more sit-down restaurant to add to the five restaurants with patios currently within Les Promenades. It also wants to continue to develop a new leisure area, which will contain activities for children and families.